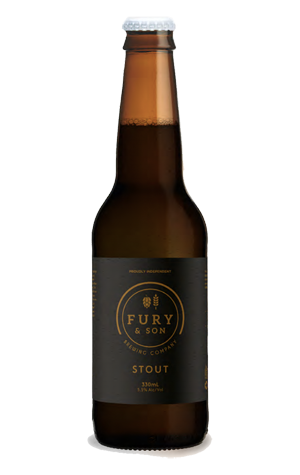 For its first two winter seasonals, Fury & Son put out a big, chewy Scotch Ale, an insight into then head brewer Craig Eulenstein’s passions. Now, with a new brewing team in place, winter 2018 sees them switch to a style more readily associated with the time of year: a stout. It’s one that comes with the sort of elegant-austere packaging more readily found on imperial stouts (or premium home audio equipment) yet which offers a much more everyman experience. It’s a drinking stout – plenty of chocolate malt, a bit of roast, some earthy hops and a touch of cocoa waiting to be found under its fluffy off white head – delivered in a light enough manner to suggest it's eager to become your sessionable fireside companion.